The structural properties of the completely positive semidefinite cone CSn +, consisting of all the n × n symmetric matrices that admit a Gram representation by positive semidefinite matrices of any size, are investigated. This cone has been introduced to model quantum graph parameters as conic optimization problems. Recently it has also been used to characterize the set Q of bipartite quantum correlations, as projection of an affine section of it. 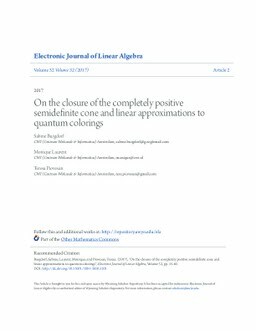 Two main results are shown in this paper concerning the structure of the completely positive semidefinite cone, namely, about its interior and about its closure. On the one hand, a hierarchy of polyhedral cones covering the interior of CSn + is constructed, which is used for computing some variants of the quantum chromatic number by way of a linear program. On the other hand, an explicit description of the closure of the completely positive semidefinite cone is given, by showing that it consists of all matrices admitting a Gram representation in the tracial ultraproduct of matrix algebras.